Today I am launching a new page called Nail of the Month! Every last day in the month I will add the best nail from the past month. I will announce the best nail of the month by dictatorial manners, but maybe sometime in the future I will add a vote so we can announce the best nail in best democratic fashion. Barry M - Croc Effects! This will just be a short post since I am working aaaall day today! I decided to re-do the triangle micro bead/studded look you saw on my thumb the other day. I'm wearing GOSH Funky Orange. I got these three things above for free yesterday! Weeee... I had to buy something to get it though..
Psst, Danish viewers - If you buy 2 Max Factor products in Matas you receive this gift! Dear readers, may I introduce to you my Pink Floyd nails, Dark Side of the Moon! The stripes are made with a pointy dotting tool. To do this you must put a drop of your chosen nail polish on a piece of paper (or something like that) and use this to dip your dotting tool in. The black polish I used is from Maybelline Colorama '677 Blackout'. I sure love this design, without being a smug or anything! 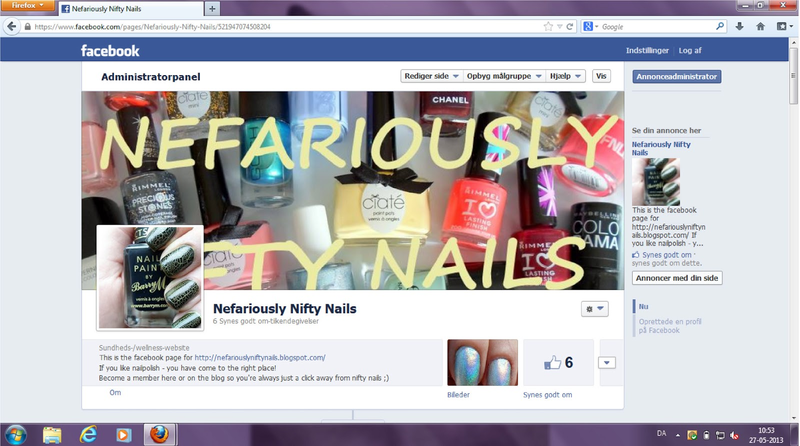 Nefariously Nifty Nails is now on FACEBOOK! Today I felt like trying on my new nail polish from Rimmel called Rhythm & Blues! It's a very dark blue that looks almost black from a distance. I love all these colors that are almost black, but still have a little color in them. Only bad thing about dark polishes is that all kinds of light reflects in them so it can be a little difficult to capture a good photo of them! As you can see I played a little with some micro beads aswell! Here are some close-ups of a the triangle on the thumb. I like how it turned out. Rimmel - Rhythm & Blues. HotMakeup - caviar micro beads. Loreal - topcoat. Ps. I have decided not to write my posts in Danish anymore. Any objections - please write to me. Have you seen Models Own's newest collection Splash?? I totally want it! The polishes are with little colored flakes in them. I specially like the purple and the blue. But I want them all! Gotta catch them all! Because of the great weather today I changed my mind - I had actually planned on something else than Futuristica holographic polish for you today! But but but, no holo without sunlight, and since we only got rain and rain and rain right at the moment I just had to take advangtage of the sun today! So therefore; FNUG Futuristica! Before using Fnug's holographic polishes it is recommended that you use Fnug's Aqua Fix Basecoat. This evens the nail and makes the holo effect brighter. As promised when I swatched FNUG psychedelic holo I did a test today to see if there is a difference with and without Basecoat. And there is! Not a big difference, but it's there. Can you guess which finger is without the Basecoat? The correct answer is................Ring finger!! Ring finger is without basecoat! It was just a littlebit less shiny than the others... All fingers are with basecoat on these next pics. So nice and sparkly! One coat is used. On the next picture I have FNUG psychedelic holo on the ring finger. It's pure silver, compared to Futuristica which is silverblue..
And finally we have a close-up! To the left: Futuristica. To the right: Psychedelic. I just love the sparkle! Hip hip hooray for holographic polishes!! So, today I want YOU to tell me what I could do better (sure I could do everything better, but I want to hear what you think) and what (if anything) I am doing right-ish on this blog. It could be anything! From layout, pictures, writings to swatching - you name it! I will use everything you say constructively to make a better blog for you. Please leave a comment or write me an email on nefariouslyniftynails@gmail.com. Thanks in purpose. It would make me HAPPYYYY!! Ps. Today I purchased some totally awesome nail gear! I won't reveal anything, but stay tuned! It's gonna be good. Hoping to receive it ASAP!! Hej igen allesammen! Jeg vil rigtig gerne høre DIN mening om hvad jeg kan gøre bedre og hvad (hvis der er noget!) jeg gør godt på denne blog. Det kan være alt ligefra layout og tekst til billeder og swatching! Jeg vil tage både ris og ros konstruktivt til mig til at lave en bedre blog til jer. Ps. Idag har jeg gjort et virkeligt godt negle-lir-køb! Jeg afslører ikke hvad, men hold jer opdateret. Det bliver godt! Håber på at modtage det hurtigst muligt! May I present for you my first attempt with caviar micro beads!! I think it turned out better than i had hoped... I thought the beads would be much more all over the place and difficult to work with, but they were very easy to deal with! I know the beads are not totally even on the nail, but that's fine with me. Me likey anyways. These are the caviar beads I used. On the other nails I made a classic French manicure. All French tips are made freehand. Here you can see it from a bigger distance. Gosh 525 Powder, Gosh F2 Nail Tip, HotMakeup beads. So do you like Caviar manicures, and did I do well? - Nailpolish you want on your other nails, or if you're doing all your nails, polish to put under the beads. - Bowl, where you collect the beads that doesn't stick to your finger (you can easily put these into the container again with a tray or simply a bend piece of paper. 1) started up by doing the French tips. 2) put a thick layer of Gosh Powder on all my nails, except the ones where the beads should be. 3) once the other nails were done and dry, I put a thick layer of Gosh powder on (in my case) the ring finger and poured the beads on my nail over a bowl. 4) press the beads carefully so they stick a little better to the polish. 5) give them some time to dry on the polish. 6) put top coat over the beads so they don't fall off so easy. Number 5 is a little important because if you put top coat over the beads before the beads are just a little dry, you move them around with the brush from the top coat. 7) allow to dry and Voila! Caviar manicure! Mit allerførste forsøg med Caviar perler! Det gik faktisk meget bedre end jeg havde håbet på. Troede kuglerne ville være meget mere ustyrlige, men de var faktisk ret nemme at styre! På mine andre negle har jeg lavet fransk manicure. Alle franske tipper er lavet i frihånd. - neglelak, til at putte på dine andre negle og/eller under dine caviar kugler. - Skål, hvori du samler de kugler der ikke klistrer til din negl. Disse kan nemt fyldes i glasset igen, enten med en lille tragt eller et foldet stykke papir. 1) Start med at lakere de negle der ikke skal have caviar kugler på. 6) Påfør top coat. Punkt 5 er vigtigt for hvis ikke kuglerne er tørret en lille smule ind på lakken, flytter de sig rundt når du rører dem med børsten fra din top coat. 7) Lad det tørre og Voila! Caviar Manicure!